How many years before the introductory rate is adjustable? In a 7/1 loan, the introductory interest rate is stable for 7 years before the interest rate can adjust yearly. 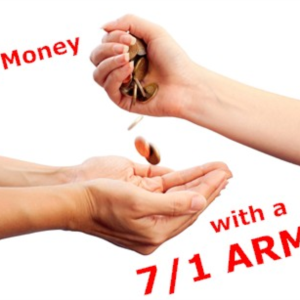 Other popular ARM home loans are 1/1 ARM, 3/1 ARM, 5/1 ARM, 7/1 ARM, and 10/1 ARM. Can you pay the ARM loan off early with additional payments? Yes, but with an ARM loan, it is more difficult to pay the loan off early because whenever the loan adjusts, it is re-calculated based on the original loan payoff date. However, additional payments will still decrease the total interest paid. More details here. Is a ARM better than a FRM (fixed rate mortgage)? This one depends on your situation. If you have foresight to know you won't be living there before the introductory rate expires, than an ARM is perfect. However, if you found your dream home and want to stay long term, an ARM loan is riskier due to the unknown situation after the introductory interest rate becomes adjustable. For others, an ARM loan can make an expensive home more affordable. What is maximum the interest rate can go up in a single year? The loan details should state how much the interest rate can go up in any single year. In my case, the rate can go up to the lifetime maximum in the first year, but each year after that, the rate can only go up or down 2%. What is the lifetime maximum the interest rate can go up? In addition to the yearly max change to the interest rate, there is also a lifetime maximum the interest rate can go up. This means in my situation where the introductory rate starts a 3.375%, the maximum interest rate I will ever pay is 8.375%. Read the 'Instruction' tab on how to appropriately fill out the details to simulate your ARM loan. It's good practice to calculate your worst case scenario. What happens after the introductory rate, the rate adjusts to the lifetime maximum. Can you still afford to pay for it? What is your backup plan? This calculator is much more basic than the first too listed, but sometimes simpler makes it easier to learn the process. It won't handle ARM rates, but only handles FRM loans.